What a nice and relaxed birthday! Nothing against you guys. I would have loved to party with all of you, but it was just perfect. I partied into my birthday with Michael and our Greek neighbours Athina and Andreas at a local reggae festival. And guess want: Thai reggae is actually lots of fun. Than we started with a slow and late breakfast, a short swim to cool down a bit and then we already got picked up for our cooking class. My present for Michael on his birthday in December had been going to a cooking class in Thailand and as by now I really felt like going to such a class as well, he gave me the same present. This might sound rather uncreative, true, but it was just perfect. When we entered the traditional Thai house with a giant kind of covered balcony and saw all the people I was a bit afraid at the beginning that it would be too many people. There were 15 people including ourself but it turned out to be no problem at all. We had to choose four dishes out of ten as a group and decided on coconut soup, fried rice and Massaman curry, and here also preparing the curry paste (which counted as dish no. 4). 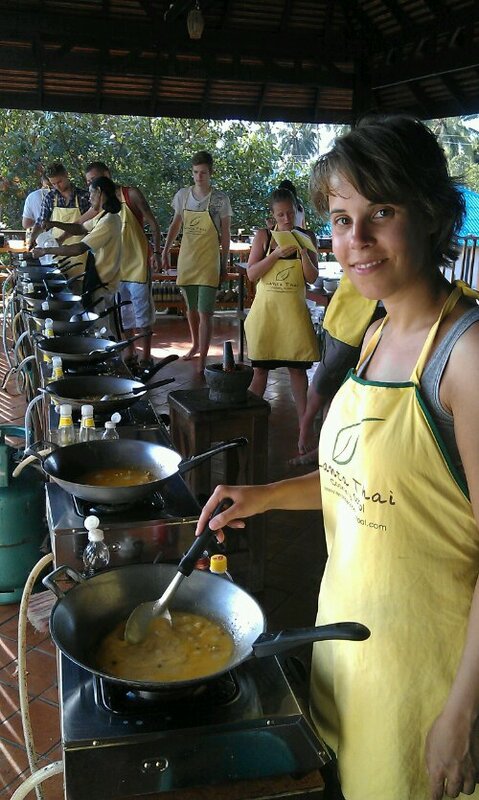 At the beginning our teacher explained to us some basic ingredients of Thai cuisine. And then it was all about cooking. We cut all our ingredients first, placing them in different corners of little baskets, so we knew what would go into the wok at what time. 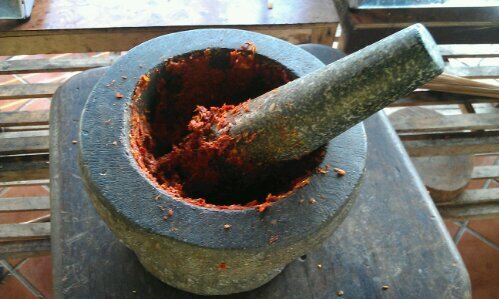 Then we prepared the curry paste. After that we went on to cook our first dish. The teacher had already realised that the two English girls that we shared a curry paste with, where not the smartest at all and singled them out to cook with him in his demonstration. Actually the two of them were quite hilarious. One had already confessed on the ride to the cooking school, that she had only cooked once in here life and as she hadn’t like it, never had cooked again. At that time I was already wondering what they were doing in this cooking class. But they were there for our entertainment as it seemed. They just sqeaked and giggled during the whole cutting and cooking process, obviously having never so much as fried an egg. And later asked us where we came from and if all the other people came from Germany too as we sounded like all speaking one language (and oh no, we weren’t. There were two more Germans but otherwise some French and some Scandinavians…). Well, but we prepared nice food anyway. First cooking our soup and eating it. Than it was all about making fried rice, a quick thing like the soup. During half of my portion I realised that the school offered the traditional Thai plastic bags to take food home and we immediately bagged half of our fried rice. Later we prepared the curry with the paste we had made before. It had to simmer for fifteen minute as it contained potatoes (meaning half a potatoe per person), giving us some time to relax. When it was ready to serve, I just tried a little, bagging most of it for later being already quite filled up from the earlier dishes. After coming back we went for another swim and are now just hanging around lazily and will soon go to our landlady and asked her for two plates and spoon, to have dinner from our leftovers. This entry was posted in Thailand and tagged Birthday, Food, Koh Lanta by kathatravelling. Bookmark the permalink.